To get the right things done, choosing what to ignore is as important as choosing where to focus. For over 30 years, Peter Bregman has worked with CEOs and senior leaders to help them create accountability and inspire collective action on their most important work. He helps leaders to develop their leadership skills, build aligned, collaborative teams, and overcome obstacles to drive results for their organizations. Peter has a deep understanding of both organizations and people and has dedicated his entire career to finding solutions that bring the interests of both together. His proven, proprietary Big Arrow process aligns people and gets them working together to accomplish an organization’s most important work. The Bregman Acceleration Model (BAM)©™ quantifies the leadership and organizational gaps that get in the way of successful execution. He has implemented his proprietary solutions with CEOs and senior leaders in many of the world’s premier organizations, including Allianz, American Express, Brunswick Group, Goldman Sachs, Morgan Stanley, Deutsche Bank, JPMorgan Chase, FEI, GE Capital, Merck, Clear Channel, Nike, UNICEF, among others. Peter is a sought-after speaker and thought leader in the areas of leadership development, organizational change, productivity and emotional courage. He is the host of the Bregman Leadership Podcast, which offers insightful conversations with industry thought leaders on how to become more powerful, courageous leaders. He is also a regular contributor to the Harvard Business Review, and his articles and commentary appear frequently in Bloomberg BusinessWeek, Fast Company, Psychology Today, Forbes, The Financial Times, PBS, ABC, CNN, NPR, and FOX Business News. 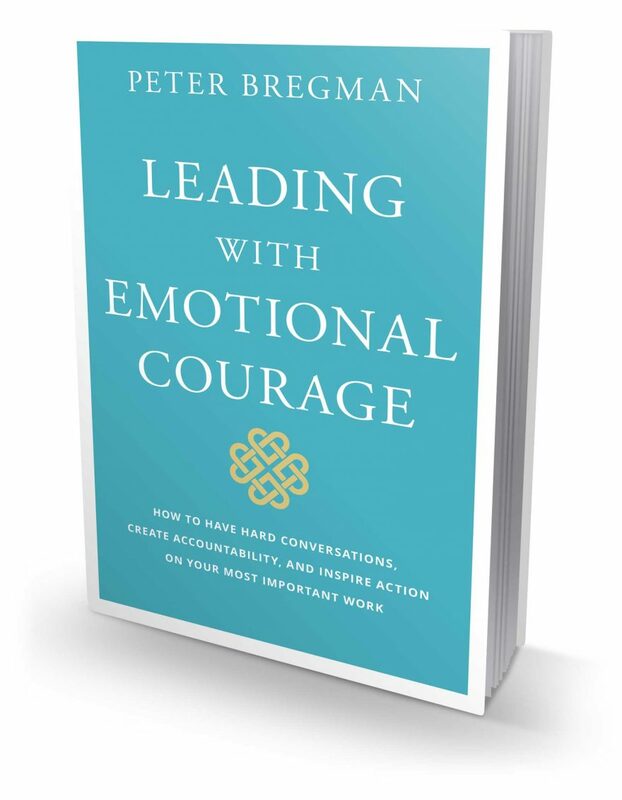 Peter is the author, most recently, of Leading with Emotional Courage: How to Have Hard Conversations, Create Accountability, and Inspire Action on Your Most Important Work (July 2018). His book, 18 Minutes: Find Your Focus, Master Distraction, and Get the Right Things Done, was a Wall Street Journal bestseller, winner of the Gold medal from the Axiom Business Book awards, named the best business book of the year by NPR, and selected by Publisher’s Weekly and the New York Post as a top-ten business book. He is also the author of Four Seconds: All the Time You Need to Replace Counter-Productive Habits with Ones That Really Work, a New York Post “Top Pick for Your Career” in 2015, Point B: A Short Guide to Leading a Big Change and a contributor to six other books. It’s all about focusing on the future, not the past. Sign up for Peter Bregman newsletter, and more.